sewing in the past: lovely. lovely. friends. last night i was privileged to go see my lovely friends emma and johanna ramsey perform with their family band "rambellwood." 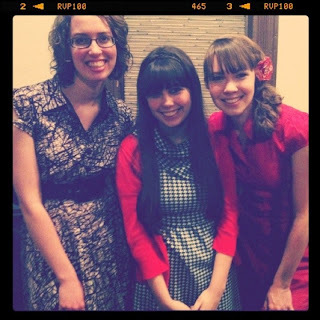 it was SUCH fun seeing them again (we only see each other about every two years) and they are all so very talented. if you've never heard any of their music head over to their band's website and take a listen. (i like leaving the page open while i'm on the computer). it's just beautiful.